This demo movie shows one person downloading a Wavewalk S4 from a vehicle’s roof rack, and carrying it from the parking space down to a rocky beach that we chose as a location for shooting video just because launching any other skiff from there would have been impossible. 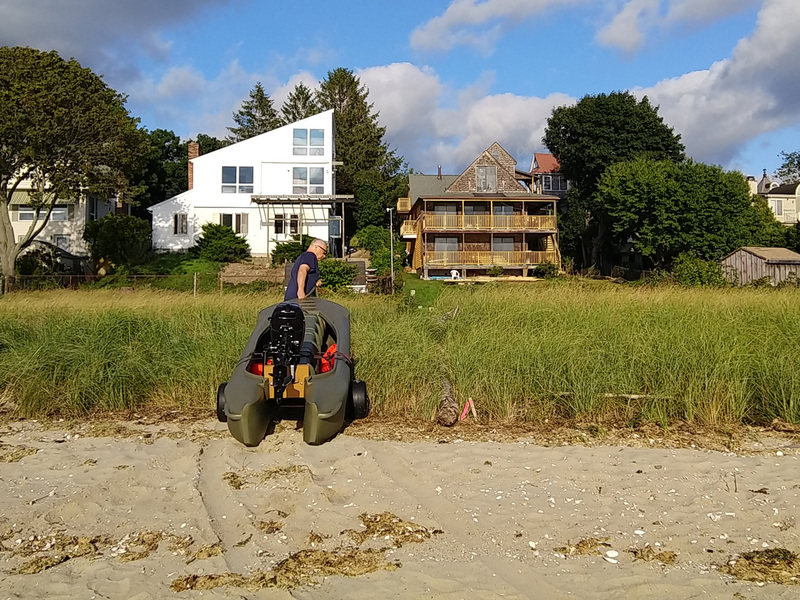 This is the story of my trip across Buzzards Bay, to the Elizabeth Islands, a chain of small islands between Martha’s Vineyard and the mainland. My first trip was ‘preliminary’ to the actual one, because it was cut short due to time constraints – I arrived to the boat ramp in Gooseberry island at the Horseneck Beach Reservation, found the parking lot full, and headed back on the causeway. I parked a quarter of a mile down the road, next to a rocky beach, a.k.a. a ‘Rock Garden’. 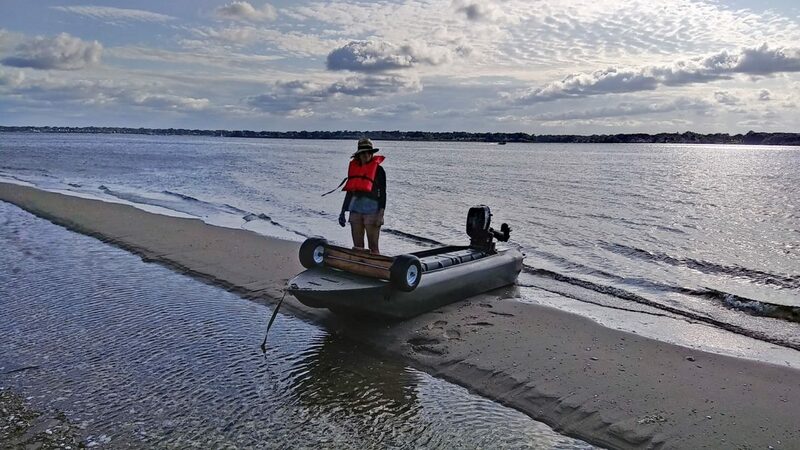 It was early in the afternoon, and by the time I launched, filled the gas tank, and tested the boat (and myself), I realized that since I’m a novice seaman, I’d have to drive slowly, namely at less than 5 mph, which would have made the trip longer than I had planned. That meant that I might have gotten back home too late, which is a no-no. What’s left from that preliminary, or shall we call it ‘Test’ trip are the panoramic view of the parking lot and the beach, and the still images from the end of the trip, where I’m seen dragging the boat on the beach, and up the ramp, back to the parking lot. Speaking of continuity, the weather was identical in both days – sunny and beautiful. That wasn’t due just to luck, since I had planned this trip a week in advance. Launching in that rock garden was a piece of cake. To start the motor, I dropped the anchor about 100 yards from shore, turned around in the cockpit so I faced the motor, added fuel to the gas tank (I did it standing up, using a long spout), and I started the motor in full comfort, like I would on a big boat. I turned around, which is easy to do in the W700, raised the anchor, grabbed the joystick, pushed in the choke, put the motor in forward gear, set the RPM, and headed to the islands. I drove at a leisurely pace, giving myself time to enjoy the ride and shoot video. Massachusetts South Shore, Buzzards Bay, and the Elizabeth Islands. I refilled the gas tank, and checked how much water got into the boat. I had a towel tucked in each rear hull tip, and both towels were almost dry, which is to say that hardly any spray got in. This is due to fact that I drove slowly and didn’t give the waves a chance to splash into the cockpit. The first half of the trip back to the mainland was a not that pleasant – The wind had picked up, and the boat was getting hit by waves from 7 o’clock, which made it harder to drive. The joystick offered me the perfect means to drive responsively and with precision, as I needed to, given that the W700 is such a small boat. Comfort wise, it was perfect. Under these conditions, driving while facing sideways and gripping the tiller directly would have been hard, and even driving while facing forward with an articulated (U-jointed) tiller extension would have been somehow uncomfortable. It turned out that this 6 HP Tohatsu motor isn’t just quiet and easy to operate – it’s also reliable. The second part of the trip back was easier. As I approached the shore and recognized the area from which I had launched, I allowed myself to drive faster, and even standing up, which felt great. Spray getting into the boat was no longer a matter for any concern as this stage, of course. Beaching in the rock garden was a piece of cake, but I have to admit that due to the shallowness of the water I wasn’t able to drive the boat high enough to step on dry land, this time. 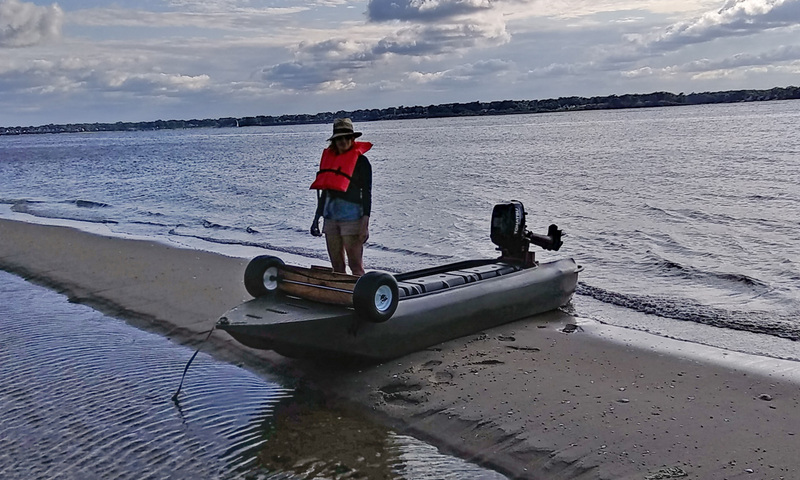 Dragging the boat up the beach and back to the car wasn’t easy… After a few steps I stopped, and I used a little manual pump that I had with me to get water out of the hulls. I also took the towels out and squeezed water out of them. Altogether, I removed a couple of gallons of water from the boat, which made it easier to pull it up to the parking lot. Other than getting my face and knees sunburned, I feel no physical impact whatsoever. No muscle tension in my legs, not even the slightest sign of back pain, and no pain in my left wrist and forearm, which could have happened had I used the articulated tiller extension in such a long drive. 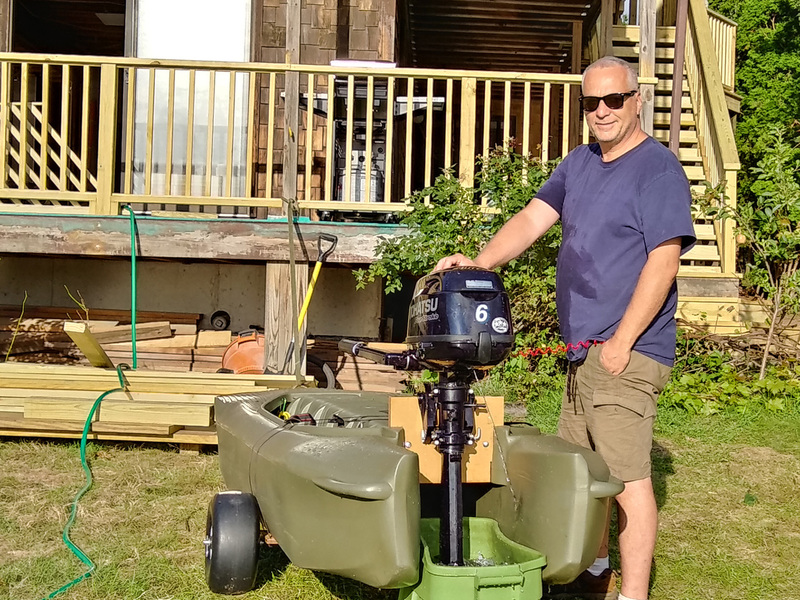 The 6 HP Tohatsu outboard features an alternator, which means that it could feed the battery powering a small electric bilge bump, and thus turn spray into a non-issue. Some smaller Tohatsu outboards feature an alternator as well. 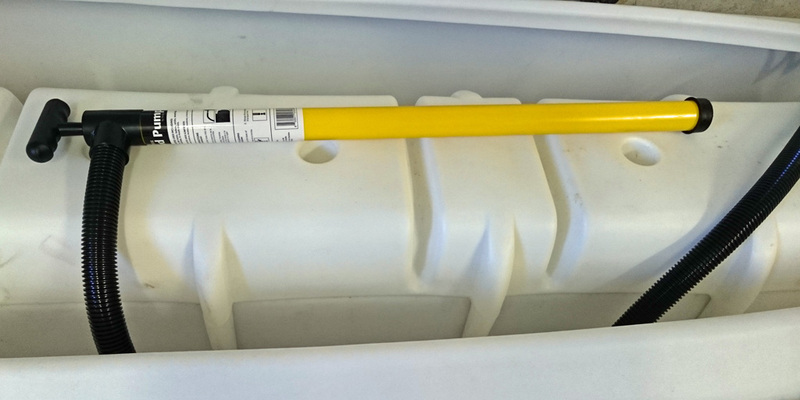 Anyways, a long manual bilge pump such as many kayakers use would do equally well, I guess.